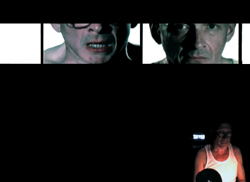 in 2002, the choreographer and director frauke havemann brought together video artist eric schefter and performer neal wach. since then, they have cooperated in investigating possibilities for dialogue between live performance and pre-produced video material. the final cut is newly created in each performance situation. mistakes and misfires, both technical and human, are part of the game. in their new production, on air makes use of various models from the sci-fi horror genre. at the center is the phenomenon alien in film scripts and film productions. the los angeles-based author mark johnson was invited to take various models, such as bill lancaster's the thing or dan o'bannon's alien, and cross them with themes of his own work. the result is an absurd version, which does not at all comply with the borders of a single genre. 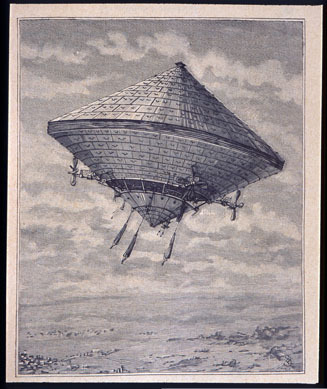 funded by the department of science, research and culture of the federal state of berlin and the fonds darstellende künste e.v., created in cooperation with tesla. 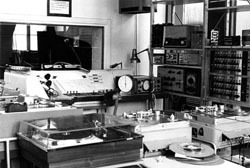 the widest imaginable variety of concepts for a radio of the future is conveyed in a prologue in march and the premieres in october, 2007 of four radio visions, situated between performance, installation and undetermined outcome. for the prologue, artists, scientists, and radio producers [artists] are invited to discuss the radio visions with their creators and to introduce highly differing ideas of the future. radio visions are science fiction. outlooks by gabriela von goerne: climatology, thomas malsch: socionics, ingo rechenberg: bionics, karlheinz steinmüller: futurology, mckenzie wark: technology. the berlin short film festival interfilm began 25 years ago. since then, sci-fi films were often presented or even, as in 1993 with 'science and fiction', or in 1999 with 'zukunft und ekstase' [future and ecstasy], whole years were dedicated to the genre which radiovisionen has also adopted. a radio tesla project funded by hauptstadtkulturfonds, in cooperation with c-base berlin, deutsches rundfunkarchiv [dra], orf kunstradio wien, swr2 ars acustica, with support from deutschlandfunk, deutschlandradio kultur, taz. study for two figures interessiert das skizzieren körpereigener bewegungsdisplays und die gedankliche, nicht eindeutig beschreibbare entfernung zwischen menschen. dabei geht es um momente der abgrenzung, spiegelung, dopplung und das verschwinden im anderen. dadurch, dass der klang auf der breit angelegten fläche 'wandern' wird, entsteht ein ungleichgewicht in der wahrnehmung des geschehens. das überzeichnen und hervorheben von vorgängen, die vernachlässigung wiederum anderer details wird möglich. zum semesterstart ist die traditionsreiche donnerstags-serie em-hören des elektronischen studios der tu berlin zu gast bei tesla. im zentrum dieser veranstaltung stehen werke, die im bekanntesten schwedischen studio für elektroakustische musik, dem ems in stockholm, entstanden sind. vom 20. bis 29. april präsentiert die akademie der künste mit unterstützung der kulturstiftung des bundes die woche des hörspiels erstmals in neuer form als ein internationales festival für hörkunst mit klarem bezug auf benachbarte disziplinen wie aktionstheater, musik und medienkunst. in diesem rahmen bringt mats lindström seine neueste komposition nordic light music zur uraufführung. danach stellt der in köln lebende, dänische medienkünstler jacob kirkegaard seine komposition tonlage vor, eine elektroakustische live-performance, die die raumakustik des kubus zum ausgangsmaterial einer klangschichtung macht. frei nach alvin luciers 'i am sitting in the room' setzt er das wechselspiel zwischen raumklang und klang im raum kompositorisch um. darüber hinaus beteiligt sich radio tesla an der woche des hörspiels und führt den ganzen monat, jeweils mittwochs, in die radiowelt skandinavien ein.